An archer shoots an arrow at a 75.0 m distant target; the bull's-eye of the target is at same height as the release height of the arrow. 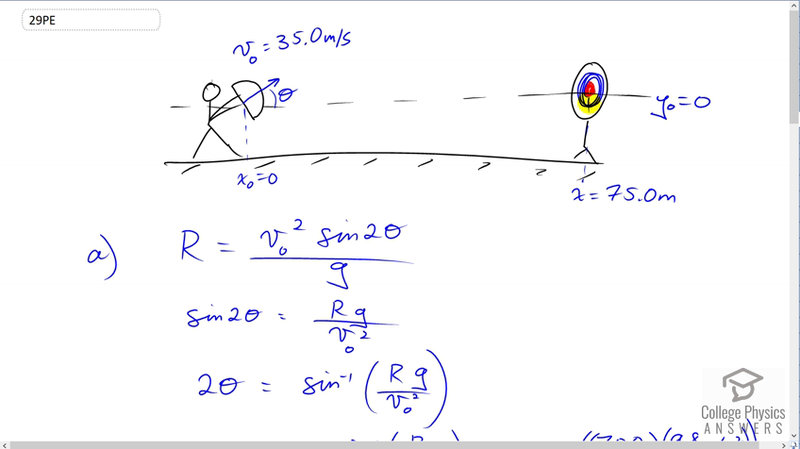 (a) At what angle must the arrow be released to hit the bull's-eye if its initial speed is 35.0 m/s? In this part of the problem, explicitly show how you follow the steps involved in solving projectile motion problems. (b) There is a large tree halfway between the archer and the target with an overhanging horizontal branch 3.50 m above the release height of the arrow. Will the arrow go over or under the branch? ed1ch03pe29 This is College Physics Answers with Shaun Dychko. This archer fires an arrow at a target which is 75 meters away and the height of the target is the same as the launch height of the arrow, and we'll say that is y naught equals zero. The speed of the arrow is 35 meters per second and we don't know what the angle of launch is, but that's part A, is to figure that out. Now because we have this convenient fact that the launch height of the arrow is the same as the target, we are allowed to use this range formula. We can solve it for theta and then that will give us this angle of launch. So the range which is 75 meters, equals the initial velocity of the arrow which is 35 meters per second, times sine of two times the launch angle, all divided by the acceleration due to gravity. We will solve this for sine two theta first by multiplying both sides by g over v naught squared and g over v naught squared cancels on the right and it appears on the left multiplied by r. Then we'll switch the sides around so we have sine two theta equals rg over squared. Then take the inverse sine of both sides and on the left side that leaves us with two theta and on the right side we have inverse sine of rg over v naught squared. Then divide both sides by two and we have that our launch angle is inverse sine of the range, times acceleration due to gravity divided by the initial velocity squared, all over two. So it's inverse sine of 75 times 9.8 over 35 meters per second squared. By the way, whenever you see g it's always positive 9.8. This g is not the acceleration per se, but it's just the magnitude of the acceleration due to gravity. Then this gives us 18.4 degrees above the horizontal is the launch angle. Part B says that there is a tree with a branch that is located halfway between the launch position of the arrow and the target. So this halfway point x subscript t for tree, is half of the range x. So that's half of 75 which 37.5 meters. We're told that the branch is at a height three and a half meters above the launch height of the arrow. Will the arrow go over the branch or under the branch is the question. So that's another way of asking at x equals 37.5, will y, the vertical position of the arrow, be greater than or less than 3.5? So we have to find out what is the y position of the arrow at this x position 37.5. So our strategy will be to first find the time at which the arrow reaches this x position, 37.5 and then knowing that time, we'll then plug into this formula for the height at that time. So horizontally, we have that the x position is -- the initial x position which is just zero, plus the x component of the velocity times time and we know what this is, and we know what this is and so we'll solve this for t. The x component of the velocity is the velocity times cosine of theta and we're using cosine because the x component is in the horizontal direction. It is the adjacent leg of this triangle given the angle is in here. Okay. We'll solve this for t by dividing both sides by v naught times cos theta and then switch the sides around. We have t is x over v naught cos theta. That's 37.5 meters the horizontal position of the tree, divided by 35.0 meters per second times cosine of the angle that we figured out in part A, 18.4349 degrees. I could have found some other way to do this question without using the number that we calculated in part A but it would have been quite complicated looking. So we'll just make things a lot simpler and use that number anyway. Normally we would want to avoid using calculated numbers to avoid propagating some error that we may have made prior. So this gives us a time of 1.1294 seconds, keeping lots of digits there in order to avoid intermediate rounding error. Now the y position then at that time is going to be the initial yposition which is zero, plus the initial y component of velocity times time, plus one half times the y component of the acceleration, times time squared. This is the acceleration of gravity. The y component of velocity will be the initial velocity times sine of theta because it is the opposite leg of this triangle. So that is 35 times sine of 18.4349 degrees times the time we figured out before, 1.1294 seconds, plus one half times acceleration of negative 9.8 meters per second squared, times 1.1294 seconds squared. That gives 6.25 meters will be the height of the arrow when it is at an x position of 37.5 meters. That is more than the height of the branch of 3.5 meters so our conclusion is that the arrow will go over the branch.